We Help Create Social Media Stars! Thank you! Be sure to Pay the submission fee. Add Twitter & Artist Name! First make your payment by clicking on the "Buy Now" button, then send us your Mixtape link. We will respond to your email (allow up to 24hrs). We keep our prices very affordable so every Artist has the opportunity to be heard. - We play your entire Mixtape/Album Live on Trend City Radio as a 1 time Exclusive. - We put your Mixtape on our website, highlight it as an Exclusive under the "Mixtape" page. - We put your Mixtape on our website, highlight it on the TREND CITY Home Page, under the "FEATURED MIXTAPES" section for 4weeks. - We put your Mixtape on the Trend City Mobile App! - We blast your Mixtape on our Twitter & Facebook Page Once a week for 4 WEEKS STRAIGHT! - We blast your Mixtape promo cover/video on our Instagram account. - A single of your choosing from the Mixtape featured on "Trend City Radio" Live Show for 3 weeks. We Promote you & your song via Twitter the Exact moment it is playing Live on our Radio Station. This way the Artist can Retweet & immediately get their Fans to interact & support. 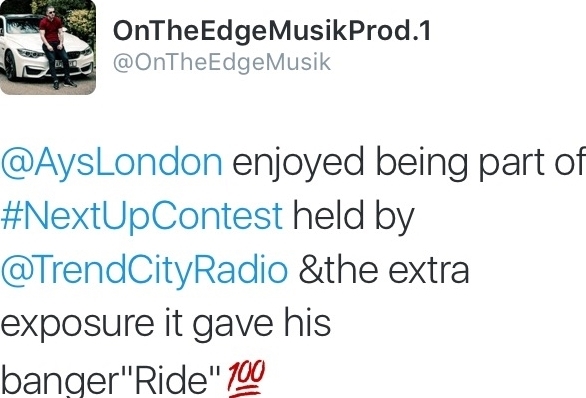 Also the Artist will be able to receive immediate feedback from our followers after being played on Radio. First make your payment by clicking on the "Buy Now" button, then send us your Mixtape/Album link. We will respond to your email (allow up to 24hrs). We keep our prices very affordable so every Artist has the opportunity to be heard. - We play & promote your entire Mixtape/Album Live on Trend City Radio once a week for 4weeks straight. - We Promote every song on the Mixtape/Album via Twitter Blast for the First Week. - We put your Mixtape/Album on our website, highlight it as an Exclusive under the "Mixtape" page. - We put your Mixtape/Album on our website, highlight it on the TREND CITY Home Page, under the "FEATURED MIXTAPES" section for 4weeks. - We put your Mixtape/Album on the Trend City Mobile App!